Carnival is the world’s largest cruise line and has more ships sailing from Miami than any of the other cruise lines. Carnival’s “Fun Ships” are known for providing cruises packed with lots of entertainment options. Onboard activities vary by ship, but may include everything from mini-golf to water parks and sky-rides. 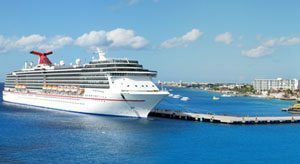 Carnival Cruise Lines ships sailing from Miami include Carnival Sensation, Carnival Victory, Carnival Vista, Carnival Magic, Carnival Horizon, and Carnival Conquest. The Carnival Sensation sails a regular schedule of 4 & 5 night cruises from Miami, providing short, fun, tropical vacations. Sailing year-around from Miami, the Carnival Victory provides a fun and affordable option for cruises to the Bahamas and Caribbean. Launched in 2015, Vista is one of Carnival’s newest and largest ships and includes lots to keeps passengers busy, including a water park and IMAX theater. Carnival Magic is one of Carnival’s newer and bigger ships. Magic offers cruisers seemingly endless entertainment and dining options. Carnival Horizon features innovative amenities such as the Dr. Seuss WaterWorks, a huge Seaside Theatre poolside LED screen, a bike-ride-in-the-sky attraction called SkyRide, an IMAX Theatre, and a new aft-view category of balcony staterooms. The Carnival Conquest is all about fun. This ship specializes in short 3 & 4 night cruises to the Bahamas and Mexico.